Kanchenjunga Base Camp Trek from Sikkim/India is also perfect option to trek and reach at base camp of mount Kanchenjunga. 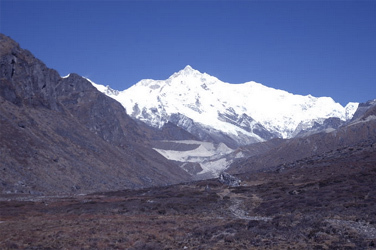 Sikkim side Kanchenjunga Base Camp is not interesting than Kanchenjunga Base Camp from Nepal. However, those who have a short time they decided to trek Kanchenjunga Base Camp from Sikkim. The sky high peaks of the Kanchenjunga massif will fill you with awe and inspiration. This area is also famous for its exotic and rare flora and fauna. According to the famous British Explorer Fresh field, who visited this area in the late 19th century, this is heaven for botanists the world over. Kanchenjunga base camp trek also provides an opportunity to see some of the most inaccessible monasteries of the world which lies in the shadow of the mighty Kanchenjunga. The original inhabitants of Sikkim were Lepchas, then came Bhotias from Tibet, who were followed by the Nepalese who settled there in large numbers and are now in a majority. Day 02 : Full Day Local Sightseeing (Procassing For Trekking Permit) Overnight at Hotel. Day 03 : Yuksam : 1,780 m.
Arrive Yuksam from Pemayangtse or Gangtok Overnight in hotel Yuksam is the base of West Sikkim’s most popular trekking region, Dzongri and is also of historical importance to the Sikkimese. Yuksom literally means ‘meeting place of the three lamas’. In the beginning of seventeenth century a rift between different factions of Buddhist sects in Tibet forced the Red Hat Sect to seek refuge in Sikkim. Lama Lhatsun Chempo, on his journey to Sikkim, arrived at Norbugang in Yuksam, where he met two other lamas, Sempa Chempo and Rinzing Chempo and began converting the people into their faith. Sacred texts had revealed that the ruler designate of Sikkim would be a man named Phuntsog of Gangtok, so the lamas sent an envoy in search of him. The party returned with Phuntsog Namgyal, whose ancestry could be traced to the legendary prince Guru Tashi, founder of the Kingdom of Miyang in the Chumbi Valley. In 1641 Phuntsog Namgyal was crowned as Sikkim’s first king, the Chogyal. Day 04 : Bakkhim : 3,005 m.
Trek Yuksam to Bakkhim - 16 km / 5 hours Overnight camp We walk gently uphill, following the Rathong River's gorge, through dense mixed jungle with magnolia, rhododendron, ferns and several varieties of orchids, brightly colored birds, and the occasional monkey. After an hour or so we cross the Paha Khola bridge, (1,733m. /5,685ft.). There is a swimming spot by a waterfall (for those who dare!) after two hours, and we can stop for lunch by a bridge over stream. Passing by sweet smelling viburnum we cross the Prek Chu River and then ascend steeply for two or three hours to arrive at the lodge at Bakhim. We will either stay in the Tourist Hostel, or sleep in our tents. This hostel is often occupied by Himalayan Mountain Institute students on rock-climbing courses. This is a long trekking day and you should expect to be pretty tired by the time you arrive at Bakkhim. Day 05 : Phedang: 3,483 m.
Trek Bakkhim to Phedang - 5 km / 4 hours Overnight camp We begin today’s walk by trekking for about one hour up to the picturesque village of Tshoka. Tshoka is home to a colony of Tibetan refugees who have erected a small monastery by a small lake. A fairly steep climb above Tshoka takes you into beautiful rhododendron forests, and you continue along a well-defined uphill path to Phedang (approx. 2/3 hours from Tshoka). Today we will be doing a shorter trail since we will be gaining much altitude. Day 06: Dzongri: 4,030 m.
Trek Phedang to Dzongri - 4 km / 3 hours Overnight camp Another short day’s walking today as we are now treading above the 4,000-meter mark. We will be setting up camp by lunchtime and suggest that you spend a relaxed afternoon acclimatizing. A brief climb beyond brings you to a meadow where we can pitch our tents in a campsite with views of Koktang, Rathong, Kabru, Khangchendzonga, Simvo and Pandim. As usual on trek the choice of campsite depends on many variables, one of the most important is the close supply of water. You will get spectacular views of Khangchendzonga, Siniolchu, Kabru, Pandim, Jopuno, Koktang, Talung and Narsing. The trail from here levels up to Dzongri. Dzongri also offers you the most fascinating close up view of the Khangchendzonga massif and other Himalayan peaks. Day 07: Dzongri: 4,030 m.
Excursion to Laxmi Pokhari Overnight Camp Early risers can get up before dawn to climb to a vantage point on a ridge above the campsite to watch the sunrise on Khangchendzonga, Kabru, Pandim, Rathong, and many other peaks of the Khangchendzonga range. Full day excursion to Laxmi Pokhari. The trial first goes through rhododendron bushes and pasture land for about an hour to Chamaray. From here it is a gradual ascent to Laxmi Pokhari, a big lake cupped in a deep crater. Here you will get good view of Khangchendzonga range, Pandim, Narsing, Kabur, Kabur dome, Koktang etc. If you reach Laxmi Pokhari early and feeling physically fit, an excursion towards Kabur rock will be a rewarding experience. Back to Dzongri. Trek Dzongri to Bikhbari - 12 km Overnight Camp The trail first ascends gradually for about half an hour & then descends till we reach a crossroad. The trail on the left goes down to Zamlingang. We follow the trail to the right, which is a flat walk throughout. Day 11 : Yuksam: 1,780 m.
Trek back to Yuksom, Overnight in hotel. After lunch trek to Dubdi monastery, ‘the hermits cell’, which is situated on the top of a lofty hill one thousand feet above Yuksam. The fir-clad mountains behind provide a dramatic background. Founded by Lhatsun Chempo in 1701, it is the oldest monastery in Sikkim. After visiting the monastery descend to the site where the first King of Sikkim was crowned in 1641 by three lamas.